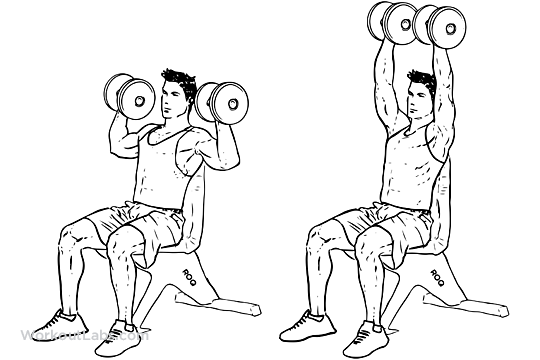 Sit on a military press bench or bench that has a back support, holding a dumbbell in each hand with an overhand grip. Place the dumbbells on top of your thighs with your palms facing down. Rotate your wrists so that the palms of your hands are facing away from you. This is the start position. As you exhale, push the dumbbells up and over your head by extending your arms until the dumbbells touch at the top of the movement. Slowly return to the start position inhaling as you do so. Note: This exercise can be performed standing or sitting on flat bench. For people with lower back problems, the version described is better.